American musician Erin Harpe, known for her soulful vocal style and accomplished fingerpicking guitar playing, was brought up on Delta and Piedmont Blues. Growing up in Maryland, she learned from her dad – visual artist, guitarist and Stella guitar expert Neil Harpe – as well as watching blues heroes John Cephas and Phil Wiggins, John Jackson, Eleanor Ellis, Warner Williams and others at the famed Archie’s barbershop in Washington DC. Later moving to Boston, Erin put out two acoustic blues albums, Blues Roots (2002) and Delta Blues Duets (2008) – an album of duets with her dad – in between touring and releasing five albums with her rock band Lovewhip (with husband/bass player Jim Countryman). 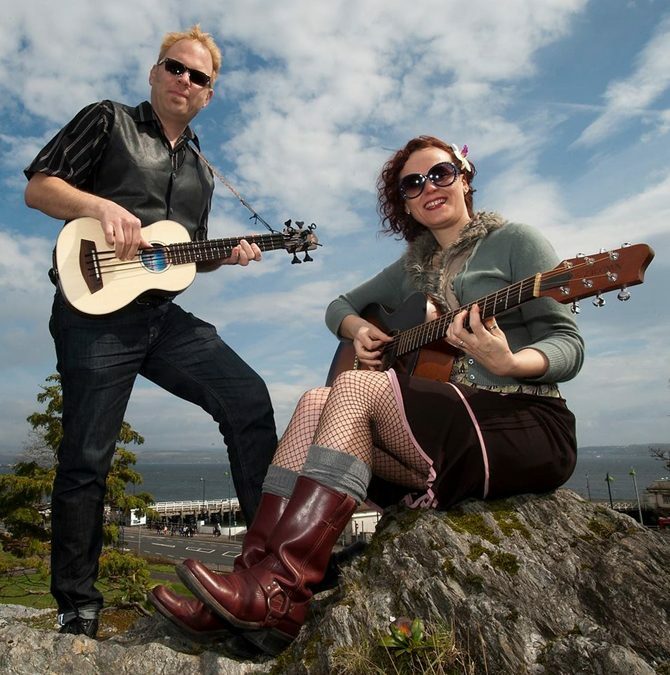 In 2010 Erin and Jim started their critically acclaimed-band, Erin Harpe & the Delta Swingers. Erin’s musicianship and vocals have earned her many fans, including guitar greats Ronnie Earl and Billy Gibbons. In 2016 she released an instructional guitar DVD/download, Women of the Country Blues Guitar – for Stefan Grossman’s Guitar Workshop. Erin loves to play the down-home acoustic blues and has played with Phil Wiggins, James Montgomery, Warner Williams & Jay Summerour, Eleanor Ellis, and many more and opened for some of the blues greats including ZZ Top, T-Model Ford, Honeyboy Edwards, Roy Bookbinder and James Cotton. Her 2019 British Isles tour sees her performing with Jim Countryman (bass) as the Erin Harpe Country Blues Duo. Support from Blue John (John Gregory). Guitarist and singer John has previously toured the British Isles as support act for country blues guitarist Ari Eisinger from Philadelphia, USA and he has also opened shows for several other American blues/roots musicians including John Miller and Grant Dermody, Joe Filisko and Eric Noden and Catfish Keith. Blue John has also performed many concerts with Mississippi John Hurt’s biographer Dr Phil Ratcliffe. In April 2018 John travelled to Chicago to play Big Bill Broonzy’s 1946 Martin 00028 guitar.